Are you seeing or hearing more coyotes this time of year and wondering why? Most people never set eyes on their resident neighborhood coyotes, who usually take great care to hide during the day and avoid people and pets. During the winter months of December – March, though, some people report the strange occurrence of a coyote following (or “stalking”) them as they walk their dog through their neighborhood or nearby park. Ordinarily, the coyote will retreat after a few moments and disappear without further incident. But still, why does this happen? It is in winter when coyotes’ fancy turns to love. To answer this question, we must first explain a bit about coyote behavior. Like wolves, most coyotes live in family groups consisting of one breeding male and female (the alpha pair), a few other related individuals, and the pups from the previous year. (Unlike wolves, coyotes don’t hunt in packs, though, since they eat small prey like mice and rats which aren’t conducive for sharing!) In their family groups, coyotes actively defend their territory from other coyote groups. One of the main ways that they do this is through howling; coyotes can distort their voices and produce a variety of vocalizations (including yips, whines, howls, and barks), making a group of four coyotes sound like a group of twenty! 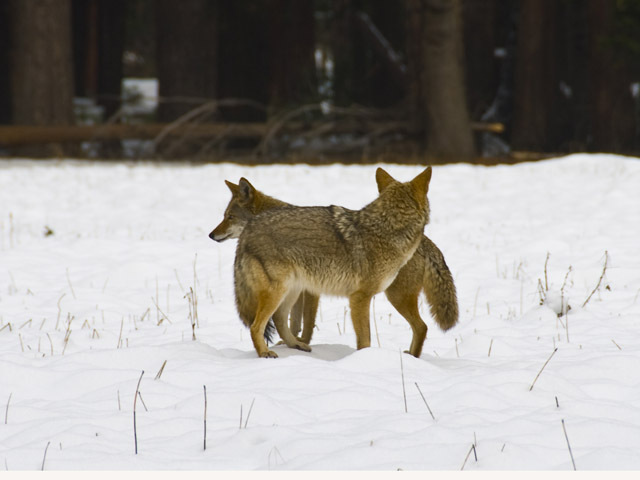 Many people are surprised to learn that coyotes are monogamous and mate for life. In fact, coyotes may be the most monogamous mammal in North America! A recent study investigated genetic data from radio-collared coyotes in the Chicago area and found 100% monogamy with no instances of cheating among coyote pairs. One reason for this may be that both the male and female coyote are needed to hunt for and care for their pups (who are usually born in litters of 4-8 during April). Once a coyote pair forms, they will stay together unless separated by death (in which case the remaining coyote will find a new mate). 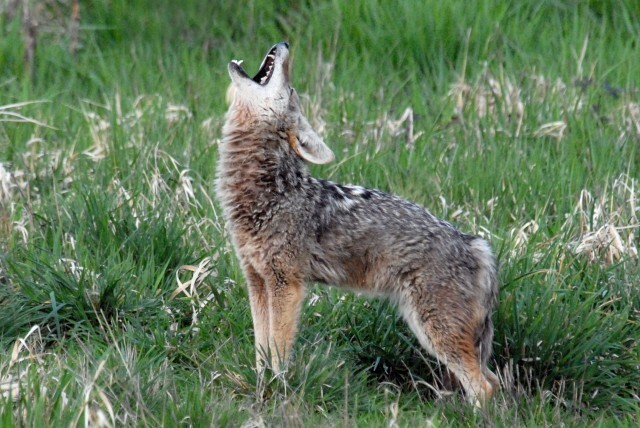 Male coyotes howl to warn others to stay away from their mates. So why this unusual coyote activity some people witness from December –March? These months happen to coincide with the coyote’s breeding season, and males get extra possessive of their mates during this time of year. You may hear more frequent howling as male coyotes signal to other males to stay away from their mate. Or, if you are walking a large dog, you may attract the attention of a male coyote mistaking your dog as a competitor. This time of year, a nervous coyote may even watch or follow you and your dog as you walk through their territory. As long as your dog is on a leash, the coyote will usually retreat after a few moments, having realized that you and your dog are only passing through and not interested in his female companion. Unleashed large dogs, especially those running loose in a park or neighborhood, are much less predictable to a coyote and may seem like a threat. Although attacks on large dogs are rare, those that do happen generally occur this time of year and on dogs that are unleashed. The best way to prevent any encounters between your dog and a coyote during coyote breeding season is to walk your dog on a leash at all times and to be outside with your dog in your yard if you do not have a coyote-proof fence. Coyotes can jump over fences 6 feet tall or less, so coyote-proof fences must either be 8 feet tall and made of a material that a coyote can’t climb or at least 6 feet tall and equipped with a deterrent such as a coyote roller on top. Coyotes can also dig, so fences should extend underground at least 6 inches or include an L-shaped mesh apron that extends outward at least 18 inches and is secured with landscaping staples. Although coyotes won’t generally bother large dogs in fenced yards, large dogs that bark at or otherwise provoke coyotes may appear to be a threat and could be at risk. If you see coyotes during your daily walk with your dog during this time of year (especially if you see coyotes in groups, which signals that they may view your dog as a threat), it would be a good idea to choose a different route or park to use until breeding season is over – it will only be a few months! With a little knowledge about coyote behavior, this seemingly threatening and scary behavior of “stalking coyotes” is revealed to simply be a “coyote in love”, nervous that someone will swoop in and steal his mate away! So next time you see a coyote in the wintertime, make sure to keep your dog on a leash, wave your arms and make some noise to assert your dominance as a scary human, and walk on by! Also let your neighbors know that there is a “coyote in love” nearby and what they can do to ease his mind.